Many people feel and tell that air-conditioned room is bad for the health. And I could say that it is true if you're cleaning only the air filter of your air-conditioner. It is true that molds that spread around through the air-conditioner's cool breeze can cause allergies or respiratory disease. Molds are ubiquitous in nature, and mold spores are common component of household dusts. The term "toxic mold" is sometimes used to refer to mold-related indoor air quality problems. You can say that you are cleaning the air filter of your air-conditioner every now and then. Therefore, there should be no such molds that spread around in your room. Toxic effects of molds that spread around from the air-conditioner can include flu-like symptoms, respiratory problems, headaches, cognitive problems, and skin irritation. You encounter mold everyday. Foods spoil because of mold. Leaves decay and pieces of woods lying on the ground rot due to mold. Those fuzzy black growths on wet windowsills are molds. Paper or fabrics stored in a damp place get a musty smell due to the action of molds. Molds are undesirable when they grow where we don't want them, especially in houses. Over 270 species of mold have been found. Molds that grow inside the house are usually different from the ones found outdoors. Depending on the type of mold present in a house, the amount and degree of exposure, and the health condition of the occupant, the health effects of mold can range from being insignificant to causing allergic reactions and illnesses. Pregnant women, infants, the elders, and those with health problems, such as respiratory disease or a weakened immune system, are more at risk when exposed to mold. How can you tell if it is a mold? Discoloration is one sign of mold. However, all discoloration is not due to mold. Carpeting near baseboards, for example, can be stained by outdoor pollution entering the house. Stains or soot may be caused by the smoke from burning candles or cigarettes. Molds may be in any color: black, white, red, orange, yellow, blue or violet and the smell may not be present for all molds. Most dangerous molds are hidden and can't be seen. Molds can be eradicated by sunlight and ventilation. But how can you do it with your air-conditioner? Air-conditioners are one of the main mold producing appliances at your home. It is because air-conditioner is the most suitable place for fungus to grow due to the high density of moisture and dusts inside. You may be cleaning the air filter every now and then as you can see below image. Yes, cleaning the air filter is a must, but dangerous fungi (molds) are inside the air-conditioner. 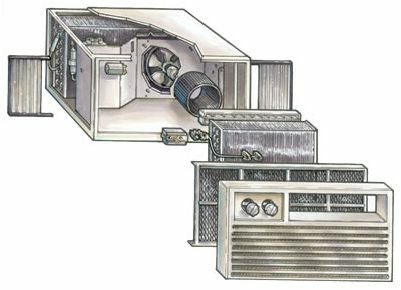 The above illustration shows the inner portion of a common type air-conditioner. It is inside where you should clean and dry to eradicate fungi. But it is so difficult for common people to clean it all the time. I tried to study how to dry and eradicate the harmful molds inside the air-conditioner. We are lucky and we found the solution of it. Molds (fungi) won't grow on dry and windy places. Turn on the air-only switch. Let the ventilator turn and send wind out. Do it for one to two hours after the air cooler is off everyday. In this way, molds inside the air-conditioner will not grow anymore as our studies show. How can you test? Place a glued paper in front of the air-conditioner for a few minutes. Then, cultivate molds (fungi), and observe under the microscope. You'll see a lot of molds (fungi). It means there are huge numbers of mold elements coming out from your air-conditioner to your room to be filled. Now, turn off the air-conditioner, and turn on the ventilation-only for a few hours. Turn on the air-conditioner again and place a glued paper in front of it. Cultivate the molds that came out from the air-conditioner. Amazingly, you can see few mold elements under the microscope. Do this procedure daily, and you will no longer see molds coming out from the air-conditioner anymore. Do it as long as you use the air-conditioner. Consumption of electricity for ventilator motor is very minimal. It is only when the air-conditioner compressor is running that consumes big amount of electricity. Make this procedure a routine and you can avoid all problems of molds or fungi on your room including smell, stress, and sickness.